Civil war has torn apart much of the city of Aleppo, Syria, and much of the country. But authorities are promoting Syria as a tourist destination in the hopes that some foreign visitors will look past that devastation. 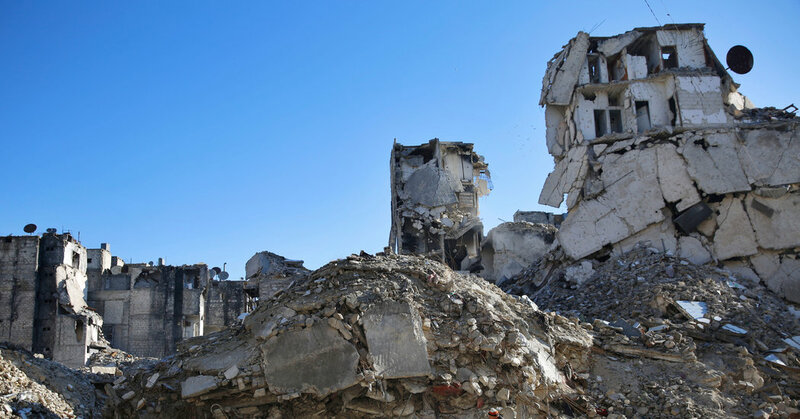 Across Syria, buildings lie in ruin. Millions have fled their homes. And historic sites have been shattered, either by military bombardment or at the hands of the Islamic State. But Syrian authorities were hoping that foreign visitors would look past that devastation, as they promoted the country at an international tourism fair in Spain on Saturday. While government officials say the country is experiencing a modicum of stability — the government has regained control of much of the territory lost in recent years to rebels — the push for tourism risks drawing criticism for ignoring the fallout of the yearslong war that has razed much of Syria. Before the country’s conflict began in 2011, Syria was home to an array of tourist landmarks, from Aleppo’s citadel to the Roman-era ruins of Palmyra, and the travel sector was a major part of its economy. Many of those sites, however, have been badly damaged or destroyed entirely by the ongoing war. The widespread insecurity throughout the conflict has meant most governments advise their citizens against travel to Syria. The country is hoping to change that. Officials from the tourism ministry attended the Fitur International Tourism Trade Fair in Madrid on Saturday in the hopes of attracting visitors back to the country. “This year is the time to rebuild Syria and our economy,” Bassam Barsik, director of marketing at the Syrian Ministry of Tourism, told the Agence France-Presse news agency in Madrid.